This tiny courtyard, tucked away behind a traditional white-painted cottage in one of the most sought-after streets in Rye, East Sussex, provided Cornus Garden Design with one of its most delightful projects to date. When our client bought the cottage she inherited a paved area with raised beds crammed with large, low maintenance shrubs and climbers. She wanted something lighter and more in keeping with the property and we were very happy to help. We cleared away the shrubs, retaining a few roses and climbers, dug over the soil, improving it with composted manure and added five colonies of earthworms to open up the structure. We then gave the two olive trees a tight haircut, pruning them back to two smart lollipops, which immediately gave the feeling of order and height whilst retaining privacy. There is little sound other than the mew of gulls and we believed that water would add an important dimension to the courtyard, installing a hand hewn granite ball surrounded with beach cobbles with primulas tucked around them. The water flows over the polished surfaces and ripples over the carved areas, producing soft reflections as well as the sound of gently bubbling water. Keeping to the idea of spheres, three silver wire ball sculptures were placed in sight-line with the French doors opening out of the kitchen. These have now weathered to a rich bronze and will continue to provide interest throughout the winter (and nightlights can be placed inside them in the evenings). Evergreen Hebe pinguifolia and a Yucca rostrata from Architectural Plants, with pointed blue–green leaves which move gently, continue the spherical theme. The planting is lush and romantic, with tiny bulbs, ferns and hybrid Hellebores Ericsmithii in spring, then roses, lilies, salvias and astrantias, Eremurus and Verbena bonariensis, Veronicastrum and Nepeta Little Titch to flower throughout the summer. The front edges of beds were planted with flowers to form tumbling mats of colour – helianthemums, thymes, dianthus and campanulas from Craigiehall Nursery in Scotland. Final touches include nesting boxes and tubs of cream Crocus Rose from David Austin Roses. The atmosphere I wanted to create was one of surprise and pleasure, a secret garden accessible only by private appointment. 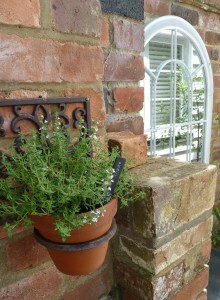 Arriving at the entrance to the garden one can glimpse just the first part of a raised bed, an iron seat and clay pots of herbs hanging on the wall. An angled mirror reflects a little more of the courtyard but it is only as one turns the corner into the garden itself that the full scale of the new planting is experienced, the play of light through leaf and flower, the plash of bright water and the flutter of wings. 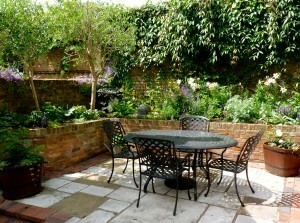 Our client is enchanted with her new courtyard garden and in particular loves her water feature. When she leaves her cottage and turns it off, she says the empty silence which follows feels as though the spirit of the garden has just left, and she can’t wait to come back.